The Binghamton men’s basketball team roster is full of new faces and a fresh energy that the squad looks to use against big-name opponents this winter. After a disappointing finish to an initially promising season last year, the Bearcats knew that they needed to institute some changes. Show, a 6-foot-3-inch Clarks Summit, Pennsylvania native, has been instant offense since transferring to Binghamton two years ago. After averaging 13.3 points per game while only appearing in 12 contests in his inaugural season, Show followed up with 13.8 points per game while improving both his free throw percentage and 3-point percentage as the team’s starting point guard. He was a standout performer at The Shipley School in Philadelphia. He earned the honor of team MVP three times over the course of his high school career. He was selected to an all-state team twice. With those accolades in his back pocket, top-recruit guard Sam Sessoms is set to enter his freshman season as a Binghamton Bearcat. Chancellor Barnard, a graduate transfer from Loyola (MD), is joining the Bearcats roster this year as a forward. At six-foot-four-inches, 200 pounds, Barnard is an imposing force on the hardwood. During his three seasons playing for the Greyhounds, Barnard played a total of 91 games. He shot 52 percent over the course of his career and averaged 4.7 points and 3.2 rebounds a game. He scored a career-high 17 points on two separate occasions, once against Boston University and the other against Fairfield. Although he competed in the Patriot League up until this point, Barnard is no stranger to America East rivals. As the Bearcats retool their roster heading into the 2018-19 season, a second-year player is expected to take a big leap. Sophomore guard Albert Odero enters his first full season with the team, and he is in line to become a major contributor. As the Bearcats look to revamp their squad and prep for success in the 2018-19 season, they welcome junior guard Richard Caldwell, Jr. to the team. Hailing from Philadelphia, Pennsylvania, Caldwell completed two seasons at Lamar Community College in Colorado — which competes against other Division I institutions in the National Junior College Athletic Association — before transferring to Binghamton this year. 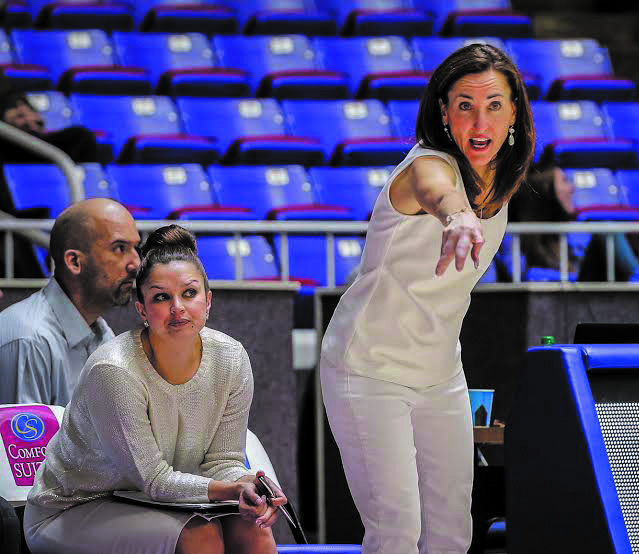 After Cimino stepped down and took a head coaching position with St. Francis in Brooklyn, New York, Bethann Shapiro Ord assumed the role of BU head coach following several years coaching at Weber State. Before Shapiro Ord’s arrival at Weber State in 2011, the team had not won more than 10 games in the three years prior. After Shapiro Ord’s hiring, she was able to attain the highest win total in program history during the 2015-16 season with 23 wins, and advance her team to the Women’s Basketball Invitational twice. With a slew of the experience and accomplishments behind their new head coach, the Bearcats could be in great shape for the upcoming season. Junior guard Kai Moon has grown under the leadership of former teammates Imani Watkins, ‘18, and Alyssa James, ‘18, and she has seen the Binghamton women’s basketball team improve considerably as a result. In Moon’s freshman year, she averaged 8.4 points, 3.5 rebounds and 2.0 assists per game on a team that went 13-17 overall. Last season, Moon emerged as the team’s second option offensively and improved across the board statistically. Moon averaged 11.5 points, 4.6 rebounds and 3.0 assists per game while improving her field goal percentage by 4.9 percent and her accuracy from 3-point range by 8.4 percent. Last season featured the Bearcats’ best regular season in its NCAA Division I history, posting a 20-12 overall record and earning the third seed in the America East (AE) Tournament. Now, with a new coaching staff and an overhauled roster, Moon is set to be the focal point of the Bearcats’ squad this season, both as the team’s point guard and its most proven scoring option. A new coach. A brand new system. Going into her senior year, forward Rebecca Carmody has every reason to be upset or pessimistic about the upcoming season. However, she is neither of those things, instead taking a positive, excited approach. Carmody has been one of the staples of this Bearcats team, from her freshman year, when she made the America East (AE) All-Rookie Team, to last year, when she dominated the AE in rebounds (No. 5 with 6.8 rpg) and blocks (tied for 10th with .6 bpg). One of only two seniors on the women’s basketball team this year, Carmody is embracing the team’s changes and her emerging leadership role. If hype could predict the future, freshman guard Annie Ramil will be the next star of the Binghamton University women’s basketball team. In Ramil’s illustrious basketball career at Binghamton High School, she scored over 1,000 points, almost 900 of them coming in just her junior and senior year alone. In her final two years as a Binghamton Patriot, Pressconnects named Ramil to its Elite 10 All-Star team. Junior guard Carly Boland may not be fresh blood on the Binghamton women’s basketball team, but this season, she’s still looking to take on a more dominating role and enhance her presence on the court. Last season, Boland earned 12 starts and appeared in 31 games, but with the departure of BU superstars Imani Watkins, ‘18, and Alyssa James, ‘18, her versatility on both ends will be more important than ever before. Expectations are running high for sophomore forward Olivia Ramil, who is striving to make her mark on the Binghamton women’s basketball squad with her footwork and willingness to facilitate for other players. Playing basketball for Georgetown University during her freshman year of college, she faced some fierce competition where she started for about half of the year, but still saw a great amount of playing time. At 9:36 p.m. on March 16, 2018, Seth Davis of CBS Sports seemed to have penciled in top-seeded University of Virginia over 16th-seeded University of Maryland, Baltimore County (UMBC) just one minute into the game. While it appeared to be an obvious selection for nearly anyone who filled out their annual March Madness bracket, the Cinderella story Retrievers were ready to shock the sports world and talk some trash as they did so. The Pipe Dream sports desk previews the upcoming men’s and women’s basketball seasons. We also sit down with David Archer, coordinator of the education minor and a member of the National Association of Basketball Coaches.